With a shrouded shackle for extra security, these rekeyable solid steel padlocks offer the greatest protection against cutting and prying attacks. 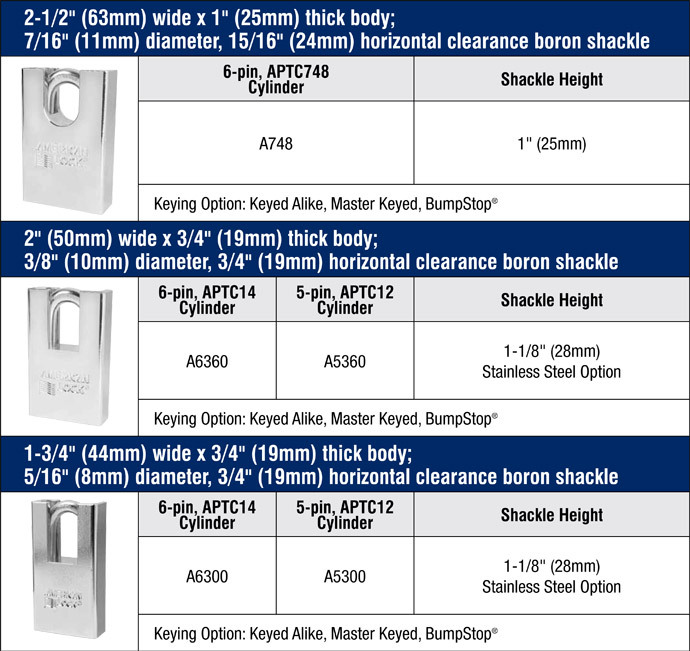 They have hardened, chrome plated solid steel bodies that resist cutting, sawing and corrosion; hardened boron alloy steel shackles for superior cut resistance; and the A748 has stainless steel cylinder pins for increased drill resistance. Enhanced keying option includes BumpStop® Advanced Cylinder Technology. Includes A748, A5360, A6360, A5300 and A6300, with specifications listed below.